The Royal Flying Doctor Service in Australia has used flaming toilet rolls to light up an airstrip in north-west Queensland. 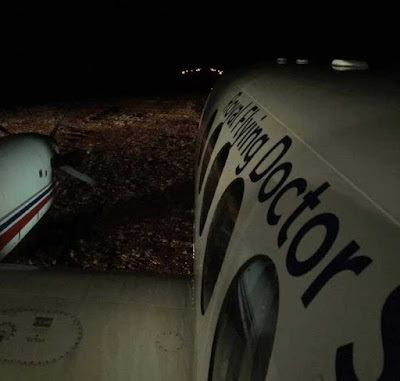 They were flying in to rescue a station hand, who was critically injured while working on a property, about 180 kilometres north of Cloncurry. Pilot Geoff Cobden said there were no flares available to light the runway, so they turned to the next best thing - 20 toilet paper rolls soaked in fuel. "I've probably landed with toilet rolls a few times a year," he said. "Basically they dip them in diesel so they're soaked, and put them out [on the runway]. "Then I tell them I'll call them on the UHF inbound … and then once I'm overhead, they light them and then I'll circle overhead to make sure they're set up correctly, and then land." Mr Cobden said flying into remote spots required lateral thinking at times. "The last resort, we can land with the lights of four cars, which gives us a touchdown point and where the other end of the airstrip is. "But that's an absolute last resort," he said. "Generally, if a station doesn't have flares, the toilet roll option is the next best thing to using car lights and most stations have got enough toilet rolls." The injured female station hand was picked up from an airstrip near the Burke and Wills Roadhouse and taken to the Mount Isa hospital.